Need more apps for your favorite device? iOSnoops can help! Here are 33 iPhone and iPad apps that have just gone free. 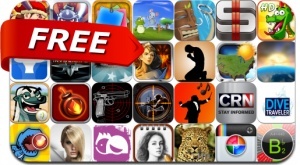 This apps gone free alert includes Monster Shooter: The Lost Levels, Feed That Dragon, Lumigon, Darkness Rush: Saving Princess, Hired Gun 3D, Crazy Bomber, The Honey Badger Don't Care and many others.